An SCR is a short form for Silicon Controlled Rectifier, Which is a three terminal semiconductor device. This device is used for rectification, regulation and inversion etc. It is also used as a controlled switch in high rating instruments. That is why this device has such importance. It is a Unidirectional Power Switch. Also Read: What is TRIAC? One may also think that we can also use transistor as a switch, then why we invented SCR. The answer for this is that Transistor can only work on low current ratings, it can't operate on very high currents and voltages, whereas SCR can handle very high currents such as thousand amperes and can also work on voltages of several KV. Now Silicon Controlled Rectifier becomes an important device of Power Electronics. It has very vast applications and now is used in many power electronics and electrical appliances. SCR is a solid state device like thyratron (triode tubes having gas filled in them). Therefore it is also called thyristor. Also Read: What is Commutation? The Silicon Controlled Rectifier was invented in 1957 at Bell Laboratories in U.S.A. And after its invention its applications and uses increased and now it becomes most important circuit element after Diode and Transistor. This device was called Silicon Controlled Rectifier because it works as an rectifier whose rectification is controlled by silicon, which is the basic building element of it. Now one may ask that why this was made of silicon? Why we didn't use Germanium to build it? The simple answer is silicon has very little leakage current as compared to Germanium, So if we uses Germanium then there'll be leakage current in the OFF state of SCR and this can't act as perfect switch. As explained before, An SCR is a three terminals and three junctions device. It is clear from the figure given below. We can also say that it is a PNPN semiconductor device i.e. A Diode and a transistor are combined together. 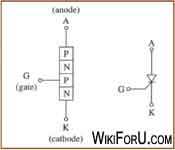 As shown in figure, the upper terminal which comes from P-side is labeled as Anode, also denoted by A and the lower terminal which comes from lower N-side is labeled as Cathode and denoted as K. The third terminal which is near the cathode is known as Gate and denoted by G.
The symbol for SCR is also shown in figure which is very familiar to Diode's Symbol.